MANAMA, Bahrain-- U.S. Secretary of State John Kerry dealt delicately on Thursday with concerns about persistent human rights abuses in Bahrain, stressing America's close military ties to one of several Persian Gulf countries with which it wants to enhance cooperation on fighting ISIS and containing Iran. 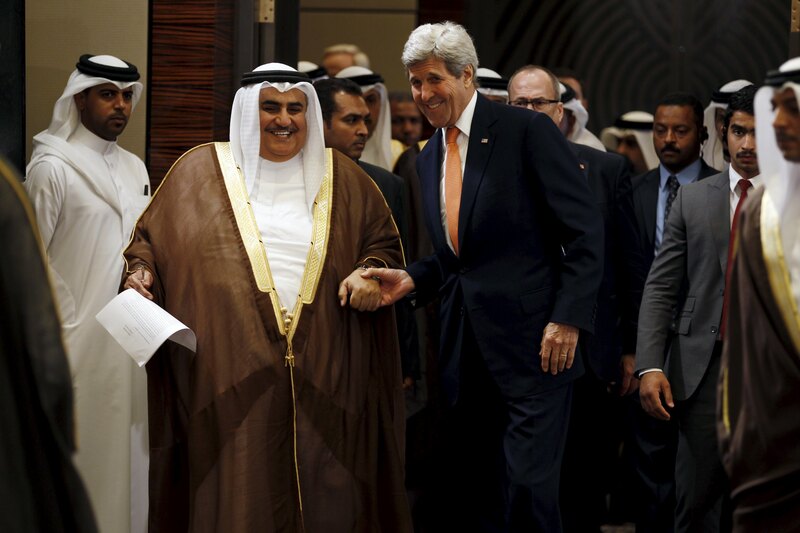 Making the first visit to Bahrain by a top American diplomat since its 2011 uprising, Kerry called the kingdom a "critical security partner" and praised its Sunni rulers for pushing human rights. He said more needs to be done to ensure the full political participation of everyone in Bahrain and promised U.S. support toward elections in 2018. A U.S. double-standard for Bahrain? Kerry, who was to meet with all of America's allies in the region later in the day, made no specific mention of the repression or discrimination against Bahrain's Shiite majority that human rights groups say is routine. His criticism was more forceful toward the opposition for boycotting previous elections. "That polarizes things instead of helping," he said. Ahead of the trip, Human Rights First urged Kerry to publicly chastise the government for imprisoning activists and peaceful dissidents. Americans for Democracy & Human Rights in Bahrain cited the case of several bloggers and political figures serving terms or awaiting trials. Groups also wanted Kerry to meet directly with opposition leaders, something that didn't appear to be on his schedule. Appearing alongside Kerry, Bahrain's top diplomat said one such individual -- Zainab al-Khawaja -- would soon be released to go home on humanitarian grounds, after she chose to go to jail with her 1-year-old child. "But the case will continue," Foreign Minister Khalid bin Ahmed Al Khalifa told reporters. On human rights, he said, his country has "done what we are supposed to do." Al-Khajawa faces up to three years in prison on multiple charges, including tearing up pictures of King Hamad bin Isa Al Khalifa. Her father is a leading activist who is serving a life sentence connected to his role in 2011 anti-government protests that were put down by Saudi and Emirati troops. Smaller demonstrations continue to this day. Kerry's larger meeting Thursday with the six-nation Gulf Cooperation Council is designed to lay the foundation for President Obama's summit with the group in Riyadh. The Islamic State in Iraq and Syria (ISIS) and Iran will feature prominently at the April 21 meeting. On the security front, Kerry got a tour of the U.S. Navy base on the island that hosts the 5th Fleet and supports U.S. maritime activities throughout the Middle East. Service members there were engaged in the second day of a 42-nation maritime exercise covering waters from the Suez Canal to the Arabian Sea. The exercise, designed to keep sea lanes open for safe passage, runs until April 26. In their bilateral meeting, al Khalifa reminded Kerry of the region's role in supplying a fifth of the world's oil and protecting vital shipping routes. Kerry then spoke of recent U.S. interdictions of weapons flows before reporters were ushered from the room. Western vessels have stopped four significant Iranian arms shipments off the Arabian Peninsula in the last six months, seizing anti-tank munitions, sniper rifles, machine guns and rocket-propelled grenade launchers. All were believed intended for Yemen's Shiite rebels, and have helped reinforce fears among Sunni kingdoms that Iran is threatening their stability. Kerry lumped Iranian actions in Yemen with its support for Hezbollah militants and the series of missile tests it has conducted since last year's nuclear agreement was reached. But he stressed that Iran also is playing a positive role in Syria, for example, by helping secure a truce between its ally, Syrian President Bashar Assad's government, and rebels supported by Western and Arab countries. But Bahrain is particularly sensitive to Iran, given its demographics and occasional statements by Iranian officials calling for the country's annexation. Whereas Kerry urged Tehran to mend ties with its neighbors, Al Khalifa said the Shiite power must work as hard on restoring relations in the region as it did to secure last year's nuclear accord. He decried Iran's "hegemonic interventions," yet promised that his country would take two steps toward rapprochement for every step by the Iranians.